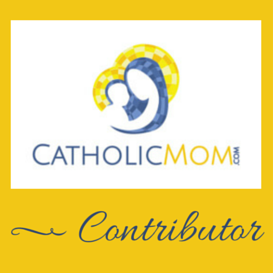 Life of a Catholic Librarian: March is National Craft Month! I know that I have some readers that are probably sick to death of me talking about crafts - so, sorry :) But I'm really into it right now; I can't help myself. Bear with me :) And yes, it truly *is* National Craft Month, so maybe I'm just infected with the fever of the season. Instead of making it a full afghan, I chose to make a smaller, more portable blanket. 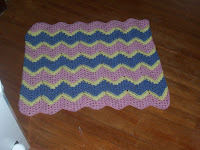 I thought it would make a nice nursing shield or carseat blanket, easy to fold up and stuff into a diaper bag. I made it with some reasonably priced yarn I found at Michael's. It's their store brand yarn (acrylic), and the color is Fresh Lilac Ombre. 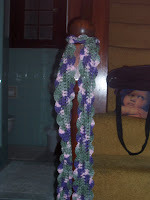 The pattern is a super quick one skein jobber; I finished it in one night. I may make some more for gifts, and so that I'll have additional colors to choose from. It's the type of light scarf that you can wear during the day just to jazz up your outfit. It's got a very fresh, springy feel to it. Other than crocheting, I am signed up for a baby hat (knitting) class at my local Jo Ann's this afternoon. I'm tremendously excited. I have a bunch of vacation time saved up, and I thought I would use it before it went to waste. I'm going to learn how to knit on those scary looking double pointed needles, which I've been wanting to do. Plus, lots of babies to make gifts for, so bonus. Ok, so, I'll move on from crafts. Although, I love them so much. I'm certain you can tell. At any rate, were you all watching Team USA in the gold medal hockey game on Sunday? We were, sigh. Obviously, we're big hockey fans here in Western New York. We're so proud of Ryan Miller (as if we have something to do with his success; but hey! we'll take credit anyway) and were really rooting for the American men to pull off a gold in hockey. As soon as I saw Sidney Crosby wearing a Team Canada jersey, I thought to myself, "oh for heaven's sake! He has the audacity to also be *Candadian*?" Because the thing is, we love Canadians. We love their anthem; we love their Maple Leaf insignia; we love their climate. And living so close to the border, we feel a bit like honorary Canadians. We'd love to be Canadian. We're honored to live near them. We always root for them. But Sidney Crosby has already wrecked havoc for my fantasy hockey team and for my real life hockey team. Does he also have to go and play for Team Canada, making them some sort of freakish hockey dream team? How totally irritating. And then! AND THEN. He has to go and score the winning goal IN OVERTIME against my beloved Ryan Miller. Can't this guy share the wealth, even a fraction? It just seems colossally unfair. Seems like he's due for a goiter to sprout up on his neck or something.